Grouplove popped onto the Indie music scene in 2011 after the release of its incipient album Never Trust a Happy Song, which featured a track list of effervescent pop/electronic hits that included the earwig singles “Colors” and “Tongue Tied.” Prior to the release of its first full-length album, Grouplove had already started spreading its unique blend of love throughout the U.S. with tours with Florence and the Machine and Joy Formidable and a self-titled EP that propelled the band of accomplished musicians onto the radar of numerous music lovers. They have yet to disappoint. On the heels of a successful U.S. tour in 2012, which included stops at Coachella and Bonnaroo, Grouplove’s sophomore release hit the music world almost two years to the day of its debut. Released in September of this year, the album reached #21 on the charts and has since featured two singles, one of which is featured in this post. “Ways to Go” is about as bubbly as bubbly can get. More impressive, it is distinctive. One of the reasons why Grouplove has found a special place in my music-saturated heart is its ability to separate itself from a plethora of other Indie Pop/Rock bands. One cannot overstate this quality – it is quite impressive. In some ways this genre of music is like shells on a beach, most look the same but there are a few that hold unique shapes and colors. Grouplove is a rare shell – when you hear the music you know it is Grouplove. In typical Grouplove fashion, “Ways to Go” sticks to you like krazy glue. It’s hook could catch even the most stubborn fish. Christian Zucconi’s vocal is infectious and it doesn’t hurt that it sits above a cheery rhythm and concordant instrumentation. The call-and-response chorus will be implanted in your head of hours, and the contrasting message of “I got a little bit longer” and “I got a ways to go” reminds me of the Beatles’ proclamation that “It’s getting better all the time … it can’t get much worse.” The lyric, which also plays on the theme of dreams, meshes well with the eccentric video with a hopelessly optimistic message – especially with recent current events. 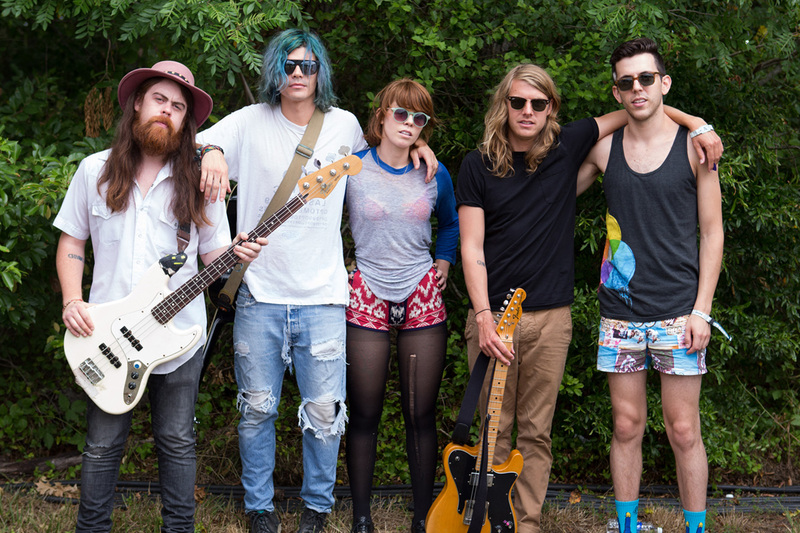 One thing is for sure with Grouplove … they don’t have a ways to go; they are already here. The band is still relatively young, but it is reaching the pinnacle of its variegated Indie sound – a hip combination of fizzy instrumentals and unconventional vocals.